Signed up for this card 3 years back to get a free luggage. After that i paid for part of my lasik surgery with it to use up the credits upon signup. Then i redeemed whatever rewards i could w the points accumulated and left it there to collect dust. Cancelled it the next time they charged me annual fee. But if you're somehow alr using a HSBC card, pls look in your inbox for a promo code to get the Entertainer app for free! Used to own this card for many years back. Last time sign up for the gifts and cash back. After this, don't have much benefits and deals anymore and they don't keep up with competitors too. Thus unless they have good gifts that you wanted, there's seems no reason to apply or own this card. Used to hold this card, nothing fantastic and signed up due to bank promotions. Regretted it and hope my review will prompt the rest to think twice! Nothing fantastic. The cash rebates for supermarket and dining etc have been outshone by the BOC Family Card. I dont see a point to use this card frequently unless there’s a specific HSBC promotion with the retailer or airline. Used this card before. While online expenditure and dining rebates are decent, the card has been bested by BOC Family card. Other than the discounted Golden Village movie tickets which is far better than any other bank's credit cards or rebates. This card dosen't have much to shout out. The following transactions will not earn you reward points: fund transfers, financial charges and late charges. For the full list, please visit HSBC’s T&Cs. 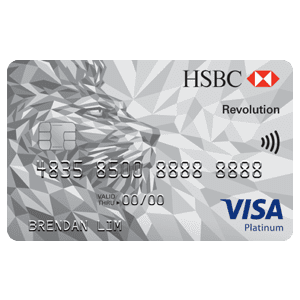 For more info, you can check out HSBC Revolution Card’s page here.